Fella Makafui popular known as Serwaa in the Youth Television Series, You Only Live Once (YOLO) has proven that not only is she s*xy and talented she is equally hardworking. Most Ghanaian guys ridicule ladies who beg guys for money to take care of themselves. Such girls have been nicknamed” Mobile Money Girls” due to the fact that they mostly request the money be sent to them through mobile money. Well, Fella Makafui has a word of advice for such ladies who rely on begging for mobile money. In an Instagram Fella Advice, such girls to work hard because that is what will earn them respect from guys. 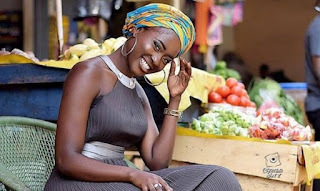 The obvious hard working Fella Makafui added that young ladies should work hard till they do not need to introduce themselves when they meet someone. Men like independent women ,hardworking ones ,they like boss ladies ........So to my young ones WORK till you need not to introduce yourself , not all of them like doing mobile money 😩😩😩 . . . Guys am I lying?? ?